This revolutionary system is one of a kind for sandblasting. 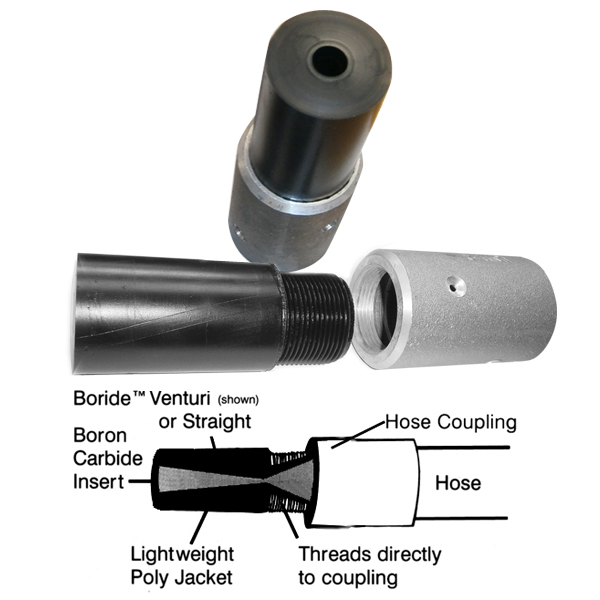 The “poly jacket” nozzles offer the same boron carbide insert as the current popular nozzle on the market. The poly jacket coating makes the whole nozzle much lighter in weight. The system does not require a nozzle cap, it simply screws into the holder/coupling and fits right against the sandblast hose. These nozzles have been proven to provide long life and are competitively priced exclusively at Miles Supply. FAP sizes available: 3/16”, 1/4”, 5/16” and 1/2”. AV000027 NOZZLE B3M4-FAP BORON 3/16"
AV000032 NOZZLE B4M4-FAP BORON 1/4"
AV000035 NOZZLE B5M4-FAP BORON 5/16"